Course Goal: To provide each participant with the knowledge and skills necessary to reduce the secondary impact of working with traumatized populations. 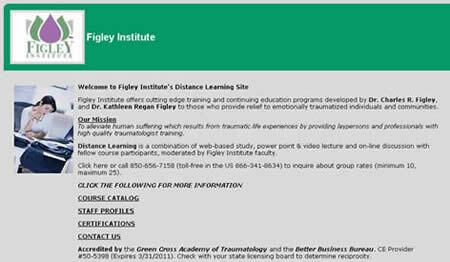 Certification Criteria: This course satisfies the requirements for Compassion Fatigue Educator certification. Target Audience: Professionals and laypersons working with traumatized populations, including disaster survivors. Course Coal: To enable each course participant to effectively build a therapeutic alliance and focus on the professional's current self-care status, building a commitment to wellness and the motivation to fundamentally transform his or her work life style. This transformation to wellness includes but is not limited to teaching effective compassion stress management methods for both containment/control of unwanted distress and finding and applying effective desensitization methods in therapy. Target Audience: Clinicians and other professionals who counsel their peers who have been traumatized by their work in the trauma treatment profession. Course Goal: To provide each participant with the knowledge and skills necessary to lessen the negative impact on individuals and families in the aftermath of a natural or human caused disaster or critical incident. Field Traumatologist Certification Criteria: Completion of the course and it's pre-requisites satisfy the criteria for Field Traumatologist. Target Audience: Professionals and laypersons who work with individuals and families impacted by disaster. Pre-requisites: FEMA Independent Study IS-7 "A Citizen's Guide to Disaster Assistance", FEMA Independent Study IS-100 "Incident Command System", and FEMA Independent Study IS-700 "National Incident Management System" . Course Goal: To provide each participant with the knowledge and skills necessary to recognize the continuum of post-traumatic stress responses and the major symptoms, to use at least five instruments to assess disorders, and to comopare/contrast six treatments for PTSD. Target Audience: Clinicians and other professionals who counsel traumatized persons. Course Goal: To provide each course participant with the knowledge and skills necessary to assess and treat children, families, groups and communities impacted by a traumatic event using systemic approaches with the entire family. Course Goal: To provide each course participant with a comprehensive overview of EMDR theory, research, treatment protocol and strategies for collecting evaluation data when using EMDR. CE Provider #50-5398 (Expires 3/31/2015). Check with your state licensing board to determine reciprocity. © 2006-2011 All Rights Reserved.